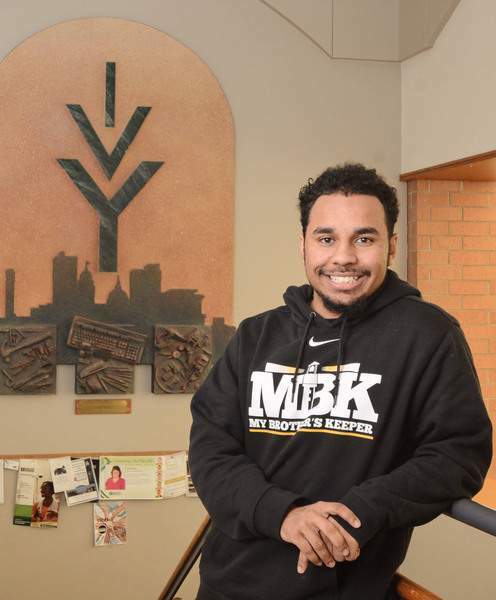 Michelle Davies | The Journal Gazette Cassius Stallings, a 21-year-old student at Ivy Tech and IPFW, credits the JAG program with his success in college. Cassius Stallings, a 2012 South Side High School graduate, has his life pretty much in order. The 21-year-old college student already has an associate degree from Ivy Tech Community College-Northeast and is working on a four-year degree in business administration from IPFW. Someday, he’d like to own a laundromat. But, he says, he would be nowhere near this far along in his education if it hadn’t been for JAG – Jobs for America’s Graduates – a national nonprofit program that targets high school juniors and seniors for career readiness. Typically, students who complete the program go on to the military, college, full-time employment or a combination. "He knew what he wanted to do," said Michele Lewis, South Side’s JAG specialist, a teacher-mentor position at each high school that offers the JAG program. "I just don’t think he was in a hurry to get there." JAG students are taught to write résumés, conduct job interviews, find jobs, dress appropriately and prepare for the End of Course Assessments, exams required by the state to graduate. They are also required to take the SAT or ACT, apply to at least two colleges and get help filling out college financial aid applications. Guest speakers come to JAG classes weekly, JAG officials said. Graduation rates hover at 91 percent. The JAG specialist, who receives teacher training in the curriculum and classroom management, also mentors students for at least a year after graduation, said Rachel Bryant, JAG program director for Region 3. Schools provide the classroom, she added. The program, which debuted in 2006 in Indiana, has been around nationally for 35 years. Two years ago, Gov. Mike Pence doubled the state resources to $12 million. Pence is vice chairman on the national JAG board. The governor’s boost in extra funding has allowed JAG programs to grow, said Rick Farrant, director of communications at the Northeast Indiana Works, the nonprofit agency that oversees federal and state JAG program funding for the Indiana Department of Workforce Development. In Region 3, based in Allen County and encompassing 11 counties, JAG programs have grown from nine to 14 in two years. Region 3 counties are Adams, Allen, DeKalb, Grant, Huntington, LaGrange, Noble, Steuben, Wabash, Wells and Whitley. Statewide, the number has grown from three pilot programs in 2006 to 116 programs, Farrant said. There are 12 state regions. Locally, the program is run through Community Action of Northeast Indiana, the agency that hires the JAG specialists, who are paid between $35,000 and $37,000 a year. Curriculum is developed at the national level and approved by the Indiana Department of Education, Bryant said. Stallings found JAG, a high school elective class, at a South Side registration after he heard some students talking about it. "I just walked up and started talking to her (Lewis) about what it was about," he said. JAG specialists also work with parents and do the usual back-to-school night presentation. During high school, Lewis said she saw Stallings’ parents, Darrell and Laura, often. Specialists are not necessarily certified teachers but are required to have a bachelor’s degree, Bryant said. Lewis said she pushed Stallings when he was a senior to consider going to college full time after high school. Even though Stallings’ year of mentoring is officially up, Lewis continues to see him weekly. She currently has 34 former students on her follow-up roster whom she contacts in person or through various social media, she said. Each school must have a JAG specialist who teaches the class and partners with employers, said Edmond O’Neal, Region 3 senior director of WorkOne Services, part of Northeast Indiana Works. Although most of the extra funding has been claimed through expansion and operational costs, the remaining funds are spoken for, primarily for student-centered programs. Those include "supportive services like transportation assistance, clothing assistance, helping students for what they call dress for success," he said, which often includes "actually purchasing clothes for those students." A JAG school program costs about $80,000 annually. If the funds were there, South Side would have more JAG classes, said South Side principal Carlton Mable. Currently, there are 81 students in four JAG classes. "When we cap our numbers, some kids are left out and there are far more kids that could benefit from the JAG program," Mable said. "Anytime you can prepare students, obviously preparing them for real-life experiences, that’s only going to give them a leg up on the competition out there for jobs." Most high schools are approached by Bryant and her staff, who look at graduation rates and the percentage of students in federal free and reduced-cost lunch programs. "Overall, there are many factors that go into deciding where to locate JAG programs within our region. Bottom line, the intent is to serve students who have barriers that would impede them from successfully matriculating from high school and/or entering into some level of post secondary training or the workforce," O’Neal said. Two years ago, Garrett High School decided to look into the program after Greg Meyers, Garrett’s Learning Center director, thought it would be a good fit for the primarily blue-collar, 600-student population. The results have been phenomenal, according to Dennis Stockdale, superintendent of the 1,750-student Garrett-Keyser-Butler Community School district. As proof, he said students are doing well in JAG-sponsored state competitions. "I read about it on the internet," said Meyers, who was a district elementary school teacher and administrator for 15 years before taking over the Learning Center four years ago. "I was looking for maybe some career opportunities for students at risk. I stumbled across the JAG program on the Workforce Development website." At first students were reluctant to sign up, Meyers said. Then the word got out "that it’s a pretty cool thing." Meyers sees it as a mentoring program. Students have to set goals on one of three post-high school choices – military, college or employment – and "then the program mentors the kids to take that path and reach their goal." Many of the students start at Ivy Tech, the statewide community college network. "They have been a great partner," said WorkOne’s O’Neal. Ivy Tech hosts JAG students on campus and organizes activities, he said. "We actually try to promote our students to apply to Ivy Tech. It’s a simple process, cost-effective and it’s local. We are very interested in retaining our local talent," O’Neal said. Jennifer Spurlock, assistant director of admissions at Ivy Tech Community College-Northeast, said many JAG students are first-generation college students. "Ivy Tech is a great option for them to get started. They are able to start here and then transfer into that four-year school," she said. The school offers free tutoring and free mentoring. Because JAG has grown in the area, Ivy Tech expects the number of students to hit closer to 600 than the 475 the college hosted on JAG Day last year. JAG Day this year is April 24. Stallings, who played football at South Side, initially wanted to attend a big university, a costly prospect when students have to pay tuition and room and board, Lewis said. When he didn’t get in, he told Lewis he wasn’t going to do anything. "Everybody gets accepted at Ivy Tech," Lewis countered. "I told him, ‘There’s nothing wrong with Ivy Tech, nothing wrong with a community college. Rather than take a year off, at least get something under your belt.’"
Stallings, now 21 and a customer service supervisor at Wal-Mart, is headed toward a bachelor’s degree in business from IPFW. "I probably wouldn’t have been in school, probably wouldn’t have graduated from college, probably went straight through to the workforce," Stallings said. "I probably would have got where I wanted, but at a lot slower rate."